Last month’s description of Deseronto as one of Canada’s leading industrial towns in the late nineteenth century is reinforced by the Canadian Patents database at Library and Archives Canada. This database has been created by digitising microfilms of patents for the years 1869 to 1894. A search for ‘Deseronto’ reveals a list of 23 patents that were filed from the town in those 25 years; a period covering its busiest industrial times. This last is one of nine patents filed in this period by Lenderoth and Edward Wilkes Rathbun in connection with the Rathbun Company’s brick and terra cotta works at the eastern end of Deseronto. The firm began producing terra cotta in 1887 and the factory continued to generate terra cotta (both structural and ornamental) and bricks until it was destroyed by fire in 1898. 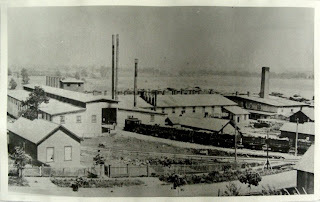 The picture below shows the works from the west in the early 1890s. The photograph was taken from Dundas Street, with First Street visible in the foreground. 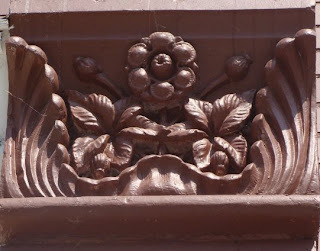 Examples of the terra cotta produced by the works can still be seen on many of Deseronto’s buildings.